My family has long been interested in genealogy searches. Several members, including my mother, enjoy trying to find members of the extended family tree, trying to trace our lineage as far back as they can. This can be challenging given that African Americans were counted as property for so long in the US. Despite this reality, it remains an enjoyable exercise in unearthing our history. More recently, my immediate family has gotten into the DNA testing game. My parents took the test and found all kinds of connections. Most stunningly, the test revealed the existence of a close relative none of us knew about. We are all in the process of learning about each other, bonding and attaching, figuring out how we feel about all this new found information. The discovery has prompted a rush of emotions that can hardly be articulated as anything but overwhelming. I had the pleasure of meeting my relative this weekend; at one point in the conversation I asked him what he thought about all of *this,* this being the discovery, how it fit into his life, how he’s managing all of this new information. He acknowledged that it was overwhelming, but that he’d been wondering and curious for so many years. He had kind of resolved to himself that some questions would never been answered, but to have them answered and to experience acceptance was more than he could have imagined. It was all still settling in. This wasn’t an adoption story, but I thought a lot about adoptees as he was talking to me. I like to consider myself an advocate of the adoptee voice, but honestly at that moment, that voice and the needs that come with it resonated so deeply within me. People want to know who they are and where they come from. There’s a desire to connect somewhere, biologically. There’s a need to understand their origin, their history. This is why they search. They have questions, more questions than I could ever dream of. I listened as my new family talked about wondering who they looked like, who their people were, did they have mannerisms like anyone related to them. I watched him and marveled at how much he looked like us; I cried when he spoke because it was like listening to another close family member—nearly tonally identical. The mannerisms were so similar too, and yet, he never knew any of us. It’s more than nurture; it’s nature, and it’s undeniable. As I tried desperately to stop staring and focus on listening to my new extended family, I thought of all of the adoptees whom I have listened to, including my beautiful daughter Hope. We’ll be traveling to see her side of our family in a few weeks. I was reminded how important those connections were. I imagined how she must have felt when it seemed that she would never have contact with them again. I smiled when I think about how I look at her face and see her birth family. I watch her grow and how her body shape is morphing to look like her aunts. I see her genes coursing through her. The search for birth families must be difficult. The call to search, the decision to heed the call, the desire and wonder to know what you’ll find at the end of the search and how it will make you feel. It must be so powerful, scary, joyous, heartbreaking and all consuming. I know that sometimes it’s something feared by adoptive parents, but it shouldn’t be feared at all. We have puzzle pieces that we need to gather. This experience, which is still developing, has provided me with a greater sensitivity to understanding an adoptee’s compelling need to know and to seek out their families of origin. I feel better about my own search for Hope’s birth mother last year. I told Hope I’d found her; she said she didn’t want the information. She might one day and I’ll be ready to give it to her. Supporting her desire to know is important, and it’s no threat to me and my relationship with my daughter. I knew it was important before, but now sitting in the midst of a different, yet similar situation has me doubling down on the importance of supporting adoptee searches for birth families. Certainly, adoptees don’t need me wandering in their space and co-signing on their voice, but I hope that other adoptive parents understand and are more supportive of their sons and daughters who choose to seek out their people. The siren of biology does matter, and our hearts must be big enough to help our families answer if we can. Sigh. Ok, let’s break this all the way down: Rep. King actually advocated international adoption for the purposes of advancing American culture against “somebody else’s babies.” Based on his frequent commentary those “somebody” folks are people of color primarily from Africa and the Middle East who are not Christian. I got to say, that while I find 99.9999999998% of what comes out of this man’s mouth and typing fingers abhorrent; I appreciate his honesty. Lots of racists hide. They used to hide behind hoods. Today they hide behind systemically crushing policies and keyboards. With Rep. King, we can watch him plant his flag over and over again. We can see that thing and name that thing. And as someone who fights oppression for a living, I prefer tangling with devils I can see. Rep. King clearly doesn’t understand that adoption is supposed to be child-focused not civilization building. He believes that we should burden our adopted children with *saving* American culture rather than focusing on ensuring they have access to safe, loving homes. King doesn’t have any care for the first parents of the children he thinks should save American civilization. King also doesn’t get that many of those “somebody” families are refugees in Western Europe who would rather not have to flee their countries of origin with nothing but the clothes on their back or to be treated like crap in the places where they seek asylum. They’d also like to raise their own children. There is no appreciation that international adoption is rife with ethical challenges, not the least of which is that the actual number of orphans that need families internationally is far lower than what is often reported. Rep. King doesn’t see the value of black and brown lives here or globally; our melanin is blamed for the threatened failure of civilizations. Oh, I could spend some time breaking Rep. King’s foolery all the way down, but I’m loathe to give this racist more airtime. It’s tough enough to dig through this guy’s public statements about race, poverty, and civics and not walk away wanting to douse yourself in Purell. Now he’s added this idea that Americans should be internationally adopting black and brown children from cultures different than ours in order to indoctrinate them. Sigh. Just imagine for a minute how he views those of us who are not white and born here in the states. I had chosen names for the children I would never give birth to. I only chose what would be first or middle names so that they could be adapted to names desired by my would be husband/life partner. Those names were so important to me; each had special meaning. Each were strong names on which my children could scaffold their identities. And then, one day, the realization set in that I would not get to use any of those names for biological children. Even now, writing this, the sting of quiet tears fill my eyes. And then Hope came along. Hope got her pseudonym from being my “Hope Kid.” When I started the blog, I had just received her profile. I remember sitting in my office, opening the email, reading the little bit of information attached and then opening the attachment to see her picture. I immediately fell in love with her. In my heart I felt like she was my daughter. I just knew, which was ridiculous because she was the first profile I received having just started the national search with my agency the week before. After we were matched, I started just calling her Hope in this space. It’s turned out to be a good strong pseudonym for her. She and I are both so hopeful. At 12, I never once thought about changing her name. Her in real life (IRL) name is unusual and lovely. A few folks asked if I considered changing her first name. No. I mean, she was 12 and It. Is. Her. Name. And well, Hope had lost everything else, everything, why on earth would I take her name from her too? And she’s feisty, why on earth would I want to start our life with a fight about changing her name? As we neared the date of our finalization, I did have to make a decision about her last name. Sounds like a no brainer, right? I mean, she would just drop her given name and take my name. It was her given name. It was hers. It was given to her by her parents, who loved her even if they didn’t always love themselves. I thought about all those adoptees who talked about their birth names and the surnames of their birth family. How hard it was to find people when names changed. How challenging taking on a new identity could be. Because Hope is an older adoptee, I had the luxury of having a real conversation with her about her name. I’d like to think that even if she had been younger, I might have come to the same conclusion because it works for us. Hope had just assumed that I would make her change her name. She understood why I might do that. She has resolved that it was just the way of the world, or rather the way of her world. In Hope’s world, she rarely got to make decisions, she lost lots of things and well, she supposed she was just happy to be getting a forever family. I asked her what she thought about a third option. I asked her what she thought about just adding my last name to her existing name. The first thing she did was write it all out and count the letters. There were a total of 29 letters in this proposed name. Four names, two of them last names, no hyphens and 29 letters. She asked if the name would fit on forms. So, I cruised the internet and found a few forms that we would have to eventually fill out and printed them and let her practice filling them out. I asked her if taking my name would be hard for her; she said maybe. I told her that she could drop it she wanted, and just sign things with her birth name. The four-name thing would just be her “government name.” I explained the times when she would need to use it. I asked her to think about it. When I told folks that this third option was on the table…well, there were so many questions. So many. Why couldn’t I just change it? Why didn’t I want her to be fully a part of the family? Wouldn’t this be confusing for her? How would this help her move on? There was a lot of criticism. I stayed focused on me and Hope during the whirlwind. In the end, extending her name was our choice. During our Facetime finalization, Hope exclaimed to the judge that her new name was 29 letters. She continued to use her birth name for a while, and then one day, she didn’t. I’m not sure exactly when she started using both last names, but I know that now she wouldn’t dare sign her name without both. When her birth family found us, they were surprised that I didn’t drop their name. I think it brokered some trust with them; I had no intention of erasing her identity. Again, I have the luxury of having an older child who is capable of telling me her feelings. I know that even during the worst of times she endured, she would leave me in a flash if she had the chance to be parented by her birth parents again. I’m hardly a saint and I’m judgmental as hell, but I’ve also had the luxury of having my birth family my whole life. I get it and I don’t blame her at all. If I had known them before, and known what I know now, I would’ve been rooting for them. But our paths were different, and all I can do now is honor her family by supporting her in keeping the names she was given. Our family is stronger for it. And what have I really learned from this part of our journey? I learned that I’m glad that we didn’t have to make a choice based on her safety and a desire not to be found. I think this would have been so much more difficult for her if that was necessary. For her to have to change her name, her identity, to remain safe, is a whole other level of trauma. We are fortunate that we were not faced with that situation. I learned that even though I have replaced Hope’s birth parents in parenting her, I am additive in her life. For Hope, I didn’t just replace them. I am her mother, without question, but I am her second mother. I can never replace Hope’s birth parents; I can’t erase them. Even with a name change, that history, however brief, is still a real part of her life. I learned that Hope’s name is her name. I am honored that my name has become a part of her name and a part of her story, but her story didn’t start with me. It won’t end with me either. I imagine that her name will change again sometime in this lifetime. And again, it will be Hope’s choice to shape her identity. I learned that there are various ways to integrate a child into your family. I learned that a last name can be more than enough of a connection to a new family. I realized just how much power adoptive parents have…to change a child’s whole name…or just to get to name a child…it is a privilege that should be acknowledged as such. I learned that the sting of not being able to have biological children rears its head more often than I care to admit. A discussion about changing a child’s name precipitates asking what might you change it to? And then your list of dream names springs to mind…and it drags that little bee sting with it. I learned to treasure my own name even more. I love thinking about the origins of my name and the story my parents tell me about naming me. I don’t know that at this point in my life I will change my name even if I get married. I’ve been with this name a mighty long time. I do know that I’ll still be ABM whatever name I chose, and that Hope will always be my Hope and joy, no matter what her name evolves into during the course of her life. I’ve been talking about my journey with Hope for 2 years, but no one had ever heard her voice until now! I’m so absurdly proud of my daughter and this was such a fun experience for us. I hope you enjoy it as we observe National Adoption Awareness Month! It’s going down, Thursday, September 17th at 8:30pm EDT/ 7:30pm CDT! 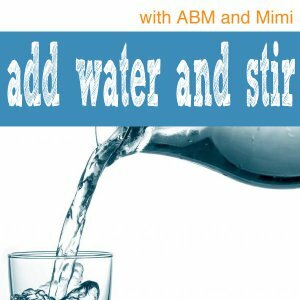 On the 28th episode of Add Water and Stir, ABM and Mimi will talk about birth mothers and the mythical narrative that surrounds them in the adoption community. Birth mothers are often cast as “saints” who save infertile couples from childlessness or “sinners” who were completely irresponsible and found themselves in an unfortunate predicament. The reality is far more complicated and rife with a lot of emotions. The hosts will unpack some of the myths and talk about ways to better support birth mothers, whether they choose to parent or choose to place their children. On the second segment of the podcast, Mimi and ABM will talk about their favorite mommy blogs and other highly touted blogs by moms out on the interwebs. Definitely get in on the blog call. Finally, no show is complete without the foolery of the Wind Down, the time devoted to talking pop culture! So, be sure to join us live on Google+ on Thursday night! Or listen to us from our podcast page, addwaterandstirpodcast.com, or on Itunes and Stitcher! Don’t forget to give the podcast a 5 star rating and tell a friend about the show! Feel free to tell us about your birth mother story below or on Twitter at @AWASPod! On the next episode of Add Water and Stir, Mimi and ABM talk about helping foster and adoptive kids make the transition home. Transitions can be hard for our kids; often they’ve been shuttled about before a match is made. It takes time to build trust, to reduce anxiety and to help kids feel safe. These can also be trying times for parents too, and self-care can be a low priority. On the second segment of the show, the ladies will discuss college savings for adoptees and foster kids. With older kids, time to save may be limited. ABM and Mimi will talk about their strategies for helping their daughters plan for the future. Of course, no episode of Add Water would be complete without a brief confab about the latest in pop culture! Join ABM and Mimi live on Thursday, August 20 at 9pm EDT/8pm CDT on Google+! Or listen to us from our podcast page, addwaterandstirpodcast.com, or on Itunes and Stitcher! Don’t forget to give us a 5 star rating and tell a friend about the show! Feel free to tell us about your transition story below! So, in my professional life, I work in higher ed on diversity issues. This week I’ve been attending a conference related to this work. I’ve given a lot of thought to what I’ve learned about diversity through this adoption journey but I realized this week that I haven’t been using diversity and inclusion terminology to describe the things I’ve experienced along they way. For every “Please don’t say this to adoptive parents or adoptees” list that I or my fellow bloggers publish, we fail to articulate what we are really mean. What we are really saying is that we folks in the adoptive community experience many microagressions. Microaggressions are like mini forms of discrimination and oppression. Wikipedia (hardly a “scholarly” source but suitable for these purposes) describes these incidents as usually unintentional, but insulting and dismissive. They are hurtful. They make us flinch. Usually associated with race, gender or sexuality, microaggressions can be committed by all kinds of people against folks being marginalized. Not sure what they look like in action? Here are some examples. “That is so gay!” Speaking louder when there is a language barrier—the person can actually hear you. Yeah, for the record, all of the above are whack. Totally, unambiguously whack. So, as I was sitting in a session this week on microaggressions, I found myself thinking about adoption, and what’s it’s been like the last year. Sometimes I gently correct and educate, other times just I let it go. But it’s those times when I have corrected and educated, and it happens again when I realize that something about my experience is not clicking in this person’s head or heart. As a speaker said today, you get a pass the first time because you didn’t know that ish you said was whack; the second time you say dumb ish after you’ve been told it’s whack, you’ve made a choice to ignore the new information. You’ve made a choice to ignore me. As the realization settled in this week at this conference, I nearly cried. For nearly two years since I went public with my adoption journey, I’ve struggled to name these little cuts I’ve felt at least once a week. I’ve been shocked by how deeply they hurt, how irritating they are, how they offer unspoken commentary about me, my life, my Hope, Hope’s life and our family. I realized how some of these things unintentionally sought to invalidate our family, to invalidate my role as a parent and Hope’s role as my daughter, to invalidate Hope’s humanity by likening her to a pet of sorts and her unworthiness of a family compared to “truly suffering” international kids. And these microaggressions are piled on to the ones I already experience as a Black woman. The cumulative impact is exhausting. And I can only imagine what microaggressions look and feel like for transracial adoptive families, birth or first families or for adoptees. Heck, during the height of the #flipthescript hashtag last fall, we saw adoptees labeled as ungrateful, inappropriately angry, aggressive, and one of the most egregious name-calling from a fellow blogger—adoption warmongers. 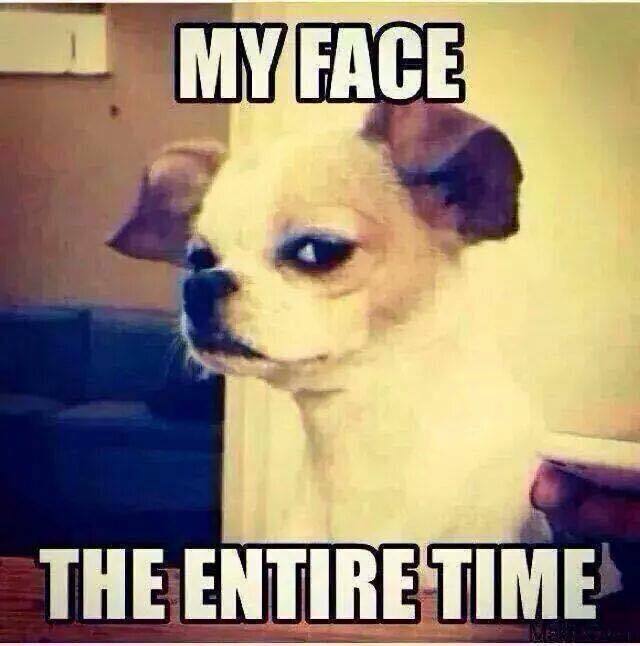 #gtfohwtbs All because adoptees claimed their agency and their voice to speak about their lived experiences. Over and over again, we saw people marginalize and/or dismiss the authenticity and integrity of the adoptee voice. It’s shameful. And *that* happened within the adoptive community! External to the adoption community, I’ve seen us reduced to a bunch of Jesus-freaks…among other stereotypes and tropes. It all makes me feel so….icky. It’s sad. It’s also bull-dookey. I mean, personally J-man is totally my homeboy, but there’s a LOT of diversity in this community, just like every other. It’s sad to realize that somehow I tripped into being another kind of minority (because being a Black woman wasn’t cool but burdensome enough) experiencing marginalization with an intriguing side of hero-worship. Because, you know, we adoptive parents are special folks (a model minority) because we are saving children from fates worse than death. And sure we are giving kids homes, but really, we just want to create and expand our families through a non-normative path. Are we really that different? In the grand scheme of things, no. We may embrace this adoptive identity, but it doesn’t mean that the microaggressions don’t get to us, that they don’t frustrate us, that they don’t somehow invalidate us as parents or as kids. We want to be seen, we want to live, we want to raise our kids and we’d prefer to be in supportive, inclusive environments where people don’t say dumb ish about adoption or anything else, for that matter. Really it’s that simple…I tell students, faculty and administrators this all the time, don’t say or do dumb ish that might hurt people and make you look like an arse. Don’t do or say dumb ish. So, I’m not sure if I’ll ever publish another list of dumb ish not to say to adoptive parents, but I might write some more about the intersectionality of adoption with our other identities, and how discrimination and oppression affects us, or rather me, especially, as a single woman of color parenting an older Black adoptive child, since that’s my own story and the one I’m best equipped to tell. In any case, let’s just try to be kind and sensitive to one another and the families we’ve created, any way we’ve created them. Be sure to join Complicated Melodi’s Mimi and AdoptiveBlackMom’s ABM this Thursday as they wade into to touchy subjects of adoption disruption and adoptee rehoming. What kinds of things lead to adoption disruption and how common (or uncommon) is adoptee rehoming? 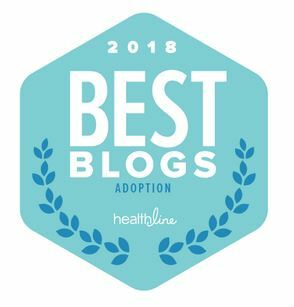 The ladies will talk about various articles on the topics and share some of their own musings about some of the scary topics no one really likes to talk about when it comes to adoption. The ladies will catch up on their respective homefronts, chat about trash tv, and mayhaps, drop a few recommendations, too! Tune in live on Thursday, April 16th at 9:30pm EDT/8:30pm CDT on Google Hangouts. Or catch us later on Youtube, our podcast page, Itunes and Stitcher and be sure to leave us a review! So, it is official: there will be no dedication, no blessing. I kinda knew this was coming, but hearing it, especially after the week I’ve had…ugh. Hope and I crashing a baby dedication wouldn’t fit the precious motif they’ve constructed. And that would be something else for me to plan and coordinate; like I don’t have enough to do. No, I replied, you’re actively choosing not to. It’s odd to reject a blessing and to do it standing on a principle. But I can’t do it, not in a backroom so that the blessing of me and Hope doesn’t offend some fellow churchgoers’ sensibilities or makes them wonder why we’re being blessed and they aren’t. Or even worse because me and my 13 year old just aren’t as cute and precious as the babies being blessed every 4th Sunday and we just don’t fit the “motif.” I don’t feel supported in doing that, and I don’t want to co-sign on that marginalization. It’s not that I’m hunting for attention, standing on stage getting blessed, but I just don’t understand the need to hide my family. I suppose I’m somehow grateful that any offer was made, but it’s hard for me to not grasp how *they* didn’t see how it might be…offensive. And hurtful, deeply hurtful. I loved my church before all this, now I can barely stand driving by it. Sadly, I am not sure I can. And it’s not even like it’s a crisis of faith or anything. I just totally disagree with the whole deal. I’m grateful to finally have this mess resolved. I’m not sure how to explain to Hope that we will be moving churches. She enjoys the services there. But we’ll be visiting other churches. I don’t want my daughter to see me just not go because of this; we need to be in fellowship somewhere. My current church no longer feels fellowshippy. I’ve been doing diversity work for a long time now. It is an odd feeling to have a new identity that somehow isn’t welcomed. It’s also an odd juxtaposition of being held up to adoption-sainthood, but being asked to be blessed in the back room. It’s odd after enduring all the metaphors about Christ adopting us and how God loves adoption…to hear that we don’t fit…I just can’t. Despite the sadness, I’m glad this chapter is now closed. Well, the beat goes on. Special thanks to the kind folks at DC127 for reaching out to me through FB with leads to churches where Hope and I will be welcome and supported in ways that will help us grow and be a healthy, successful family. I’m going to turn my attention to pursuing some of those leads and finding us a new church home.